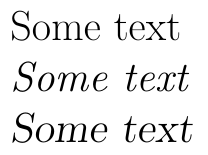 As I understand, LaTeX supports both via \textit and \textsl respectively, but what is the difference between the two? Notice that two of these faces have an "oblique" slope for emphasis: Slanted type is essentially the same as roman, but the letters are slightly skewed, while the letters in italic type are drawn in a different style. (You can perhaps best appreciate the difference between the roman and italic styles by contemplat- ing letters that are in an unslanted italic face.) Typographic conventions are presently in a state of transition, because new technology has made it possible to do things that used to be prohibitively expensive; people are wrestling with the question of how much to use their new-found typographic freedom. Slanted roman type was introduced in the 1930s, but it first became widely used as an alternative to the conventional italic during the late 1970s. It can be beneficial in mathematical texts, since slanted letters are distinguishable from the italic letters in math formulas. The double use of italic type for two different purposes—for example, when statements of theorems are italicized as well as the names of variables in those theorems—has led to some confusion, which can now be avoided with slanted type. People are not generally agreed about the relative merits of slanted versus italic, but slanted type is rapidly becoming a favorite for the titles of books and journals in bibliographies. As Philippe Goutet comments, Knuth's account is biased. What he fails to mention is that the widespread use of slanted type in the 1970s was only due to the fact that to cut the cost of making an italic font, the roman font was automatically slanted, which deforms letters (see e.g. blogs.adobe.com/typblography/2010/05/hypatia_sans_pr). For example, Knuth's slanted cmss has many of the typical defects of automatically slanted fonts, even though he used Metafont. And even today, serif typefaces with a good slanted variant are extremely rare, so if you care about typography, you should stick to italics. 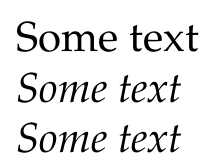 As a final remark, besides the commands (with arguments) \textsl and \textit for slanted and italics, respectively there's also the font switches \slshape and \itshape. Not the answer you're looking for? Browse other questions tagged fonts italic slanted or ask your own question. Is there a difference between \textit and \itshape? Difference between `\sl` and `\slshape`? 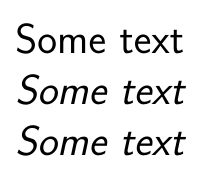 What is the difference between \text, \textt and \texttt?